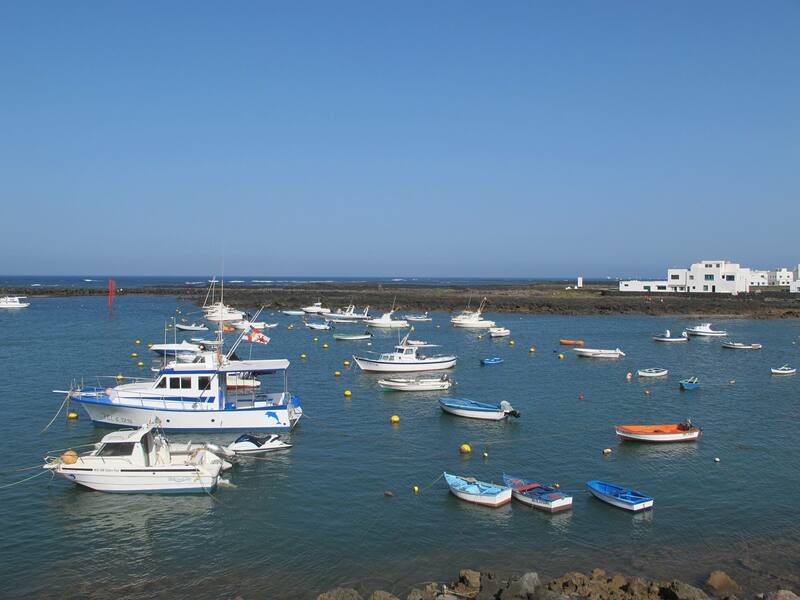 I was lucky to arrive to Lanzarote Island by boat. 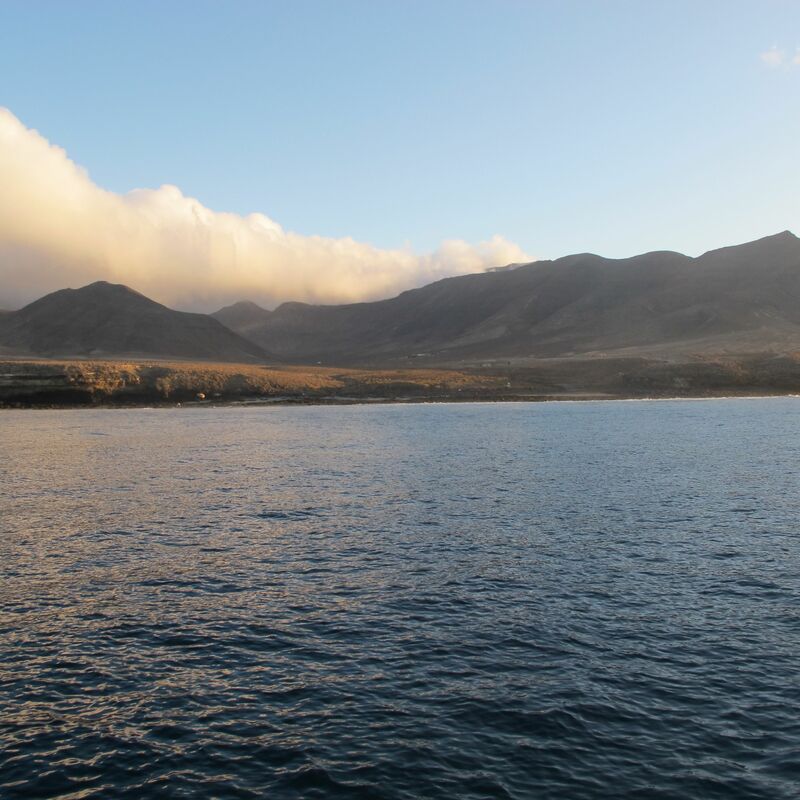 As we silently sailed passed the black beaches, villages, ports, cities and vacation communities backed by brownish – black volcanic mountains, the island seemed surprisingly large. 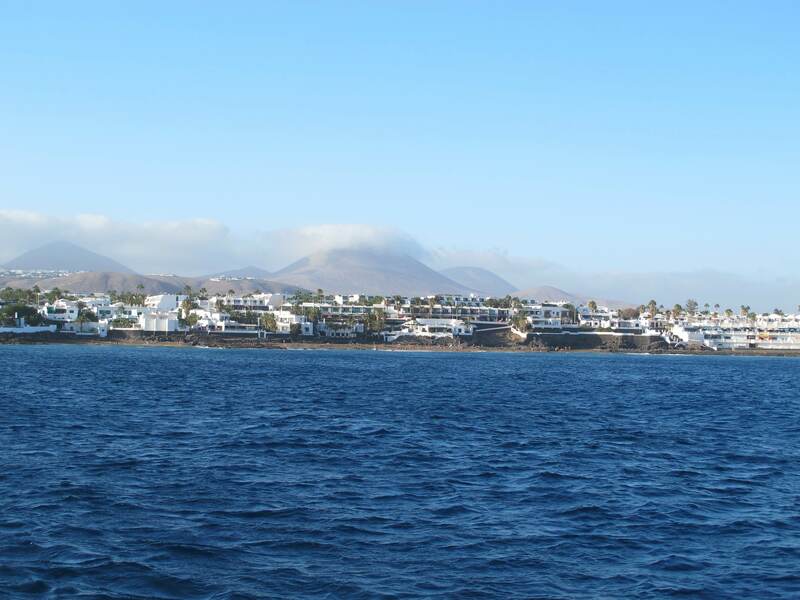 We are sailing on the southern side of the island toward Puerto Calero, a marina south of Arrecife. 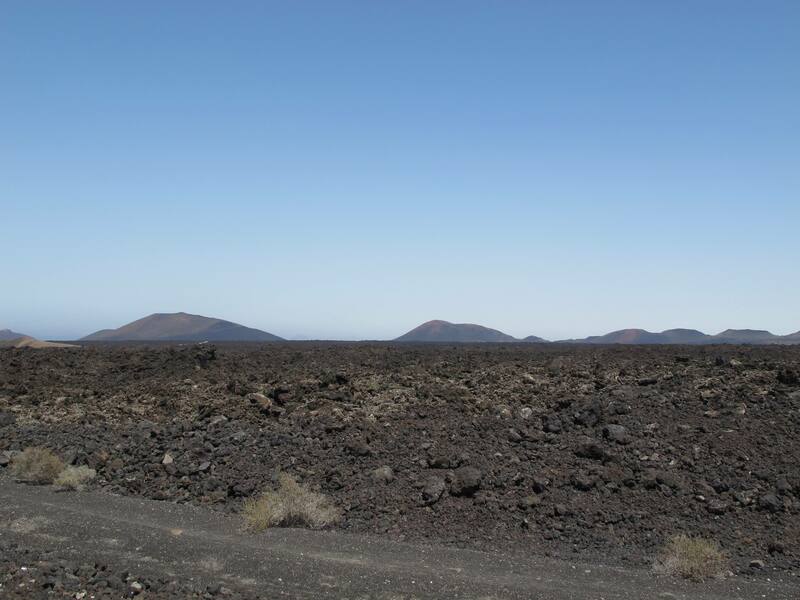 The island of Lanzarote is 1 of 7 larger Canary Islands that lie 100+ miles off the coast of Morocco. The Islands are owned by Spain. As we scoot down the coast, Arrecife, Lanzarote’s largest city sits on the coast line halfway between its northern and southern points. The Canary Islands are a popular sailing destination and often the final stop before sailors set sail for their Ocean crossings. Even Christopher Columbus stopped in Grand Canary Island before his final sail across the Atlantic to finalize repairs, pray in the local Cathedral and stock up on supplies. All the Large Canary Islands have airports that connect each island and Europe. 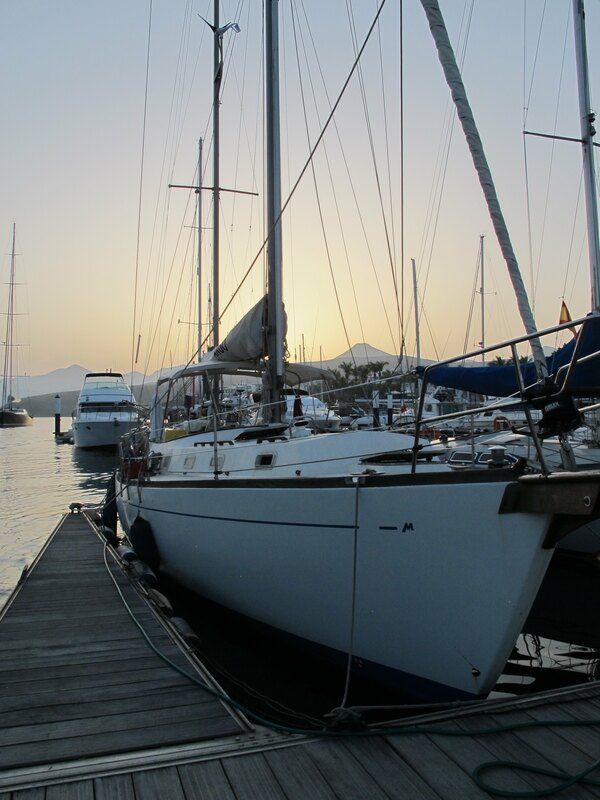 It also has numerous ports for both large cargo ships and sailboats like ours. About 15 years ago there was an enormous push to improve marinas and ports throughout the islands and it has proved to be a good idea. 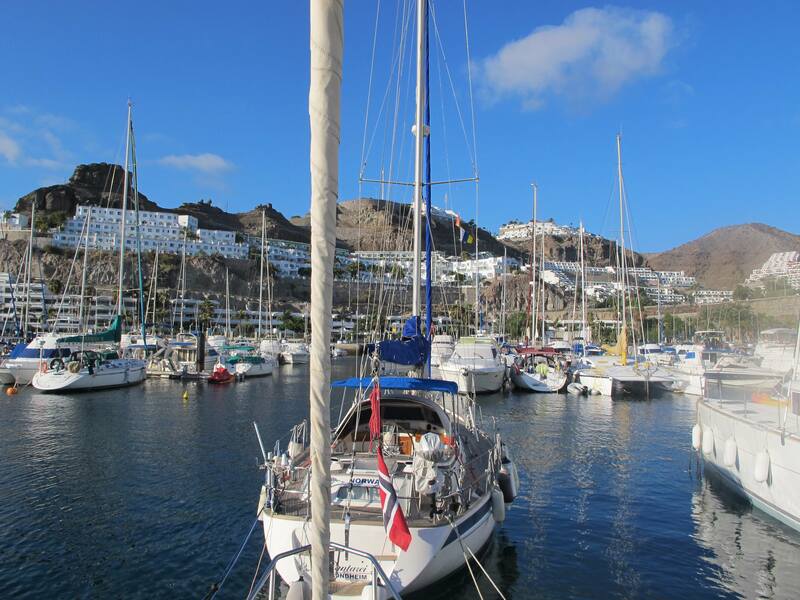 As a result the Canary Islands enjoy a thriving boating and sailing industry year round in addition to its enormous cargo ship industry. It is estimated that 5 million people visit the islands per year. The number has decreased a bit due to the global recession but none the less, a thriving tourist destination. Lanzarote is one of the larger islands in the chain… Canarians have different accents depending on the island they live and the traditional Spanish “TH” sound seems to be abandoned here. There are large distances between the islands and although there are high speed ferries and planes that connect the islands, if you are sailing like we are, it is a days sail between each. 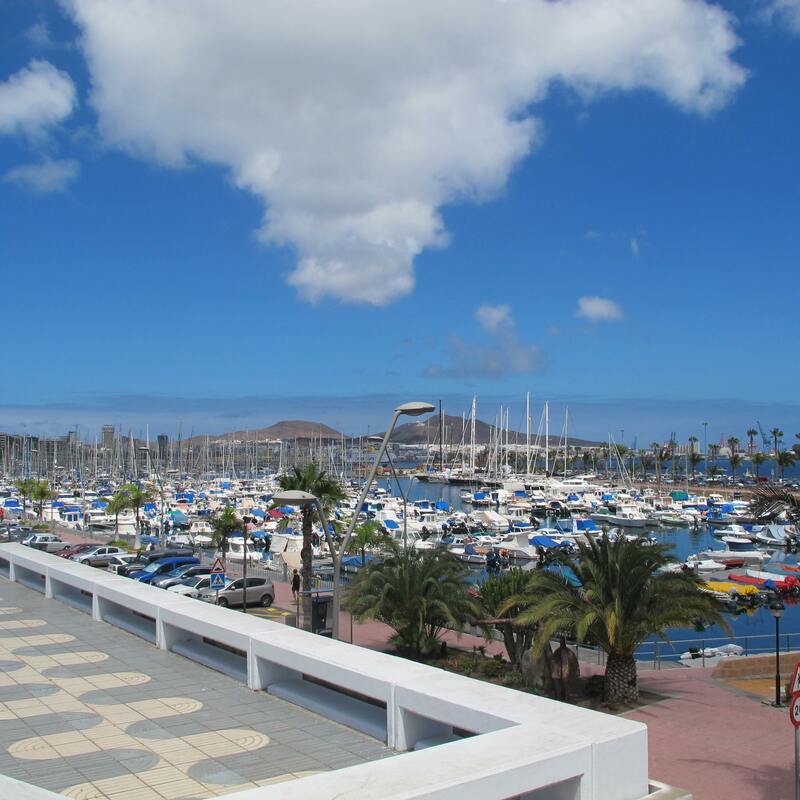 On arrival to the Puerto Calero, a beautiful marina and port town on the southeast end of the island, we are relieved at the facilities. This is a full service marina with restaurants, showers, shops, grocery and a huge seawall surrounding the marina to the water is calm and the boat barely moves, a welcomed change from the rocking and rolling we experienced for the last 5 days. The crew at Puerto Calero! We arrived and were greeted by deck hands as well as tourists. Jumping off the boat I felt like screaming “I have been on this boat for 5 whole days sailing the Atlantic Ocean!” I felt like a cast away come home and walking on land for the first time in days was strange and made me dizzy. There was a ton to do on the boat as far as clean up but all we were interested in was a hot shower and a glass of wine and a good nights rest. The morning brings a ton of dew. I think it must be from the heat generated from the black mountains that turn lavender during the sunset. The morning calls for deck duties, cleaning up, organizing and fixing things that broke along the way here. I am told by the skipper that sailing is really moving from port to port buying parts for the boat. I have also heard that the best day of your life is buying the boat and the next best day is selling it. We joke about posting a “se vende” sign on the boat after this trip, but actually, seems like a terrible idea. Boats can become addicting, I can see it happening. After a day of chores we decide to check out Arrecife, the main city here. We were looking to rent a car or grab a taxi – neither of which were available at the marina so we hitched a ride, thanks to the skipper who will now be referred to as Manuel for the next few posts. Manuel ask Eugenio for a ride and Eugenio is a Canarian that is happy to accommodate our 20 minute ride into the city. He suggests some restaurants and towns to see and is otherwise very personable. The Spanish here looses the “THE THE THE” sound that we heard in the south of Spain, and the Spaniards here seem more Latin American to me… Eugenio drops us off at the city center and after a quick jump in the water with the locals, Manuel spots a rent a car sign and walks over. For about 30 euros where we were offered a broken down Renault that I could swear was someone’s personal car that they slapped a rent a car sticker on as we were filling out the paper work! Still, it moved and had air-conditioning so off we went. For dinner we decide to go inland to a local town called Yaiza. Driving here is surreal, there are no trees and as the sunsets behind the mountains it gets dark quickly – the car lights coming from the above hill look like they are coming in for a landing on the moon! Somehow the sky and the land blend into each other at dusk. Arriving in Yaiza, we were happy to find an enormous town festival with rides and live music and asked around for a local restaurant. “La Era” was recommended and a bit of a tourist destination. Still the servers were kind, the local fare delicious and the atmosphere divine. 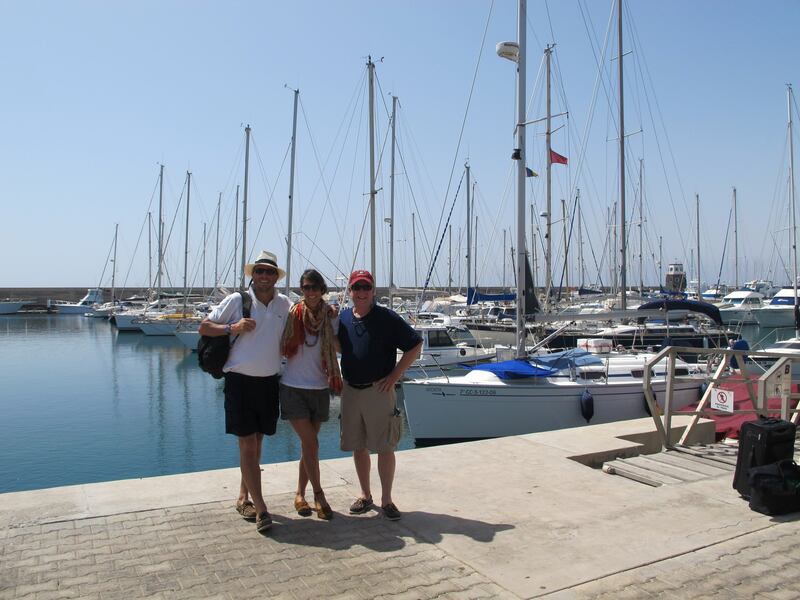 We drank local wine and ate Canarian fish stew with Pappas con Mojo. “Mojo” is a sauce usually made with garlic, parsley and pepper and such. They have green “Mojo” and red “Mojo” it can come spicy or mild, it seems that each restaurant has its own “mojo” and served with potatoes is delicious and vegetarian! 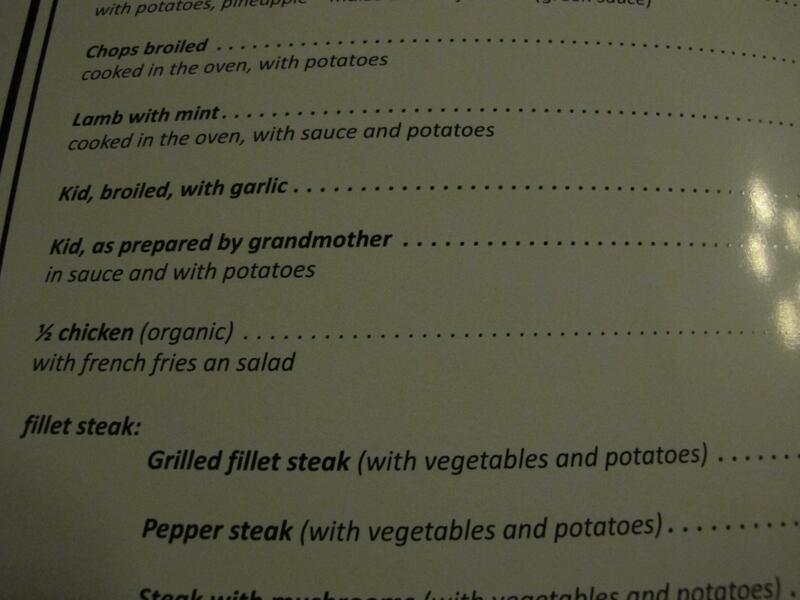 Check out my menu and the english translation it is hysterical! The next day we took a drive around the entire island. Our first stop was Playa Blanca which lies on the southern tip of the island and is a German enclave. There are more street signs in German here than in Spanish! The port side of town is dotted with restaurants and shops and beaches dotted with sun worshipers… the air is cool and the sun is hot. It is september and tourism decreased for back to school. 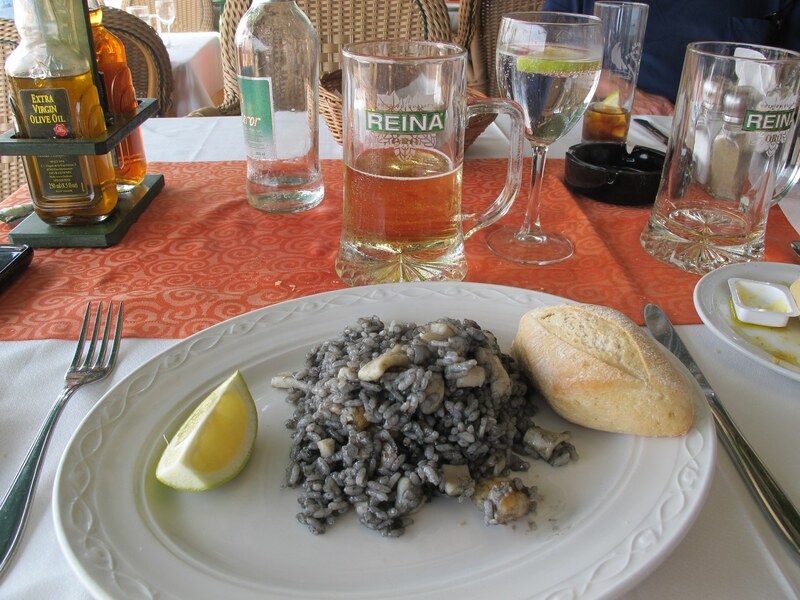 Still The Canary Islands enjoy a year round tourist industry… We found a restaurant that served us the most delicious squid ink paella! 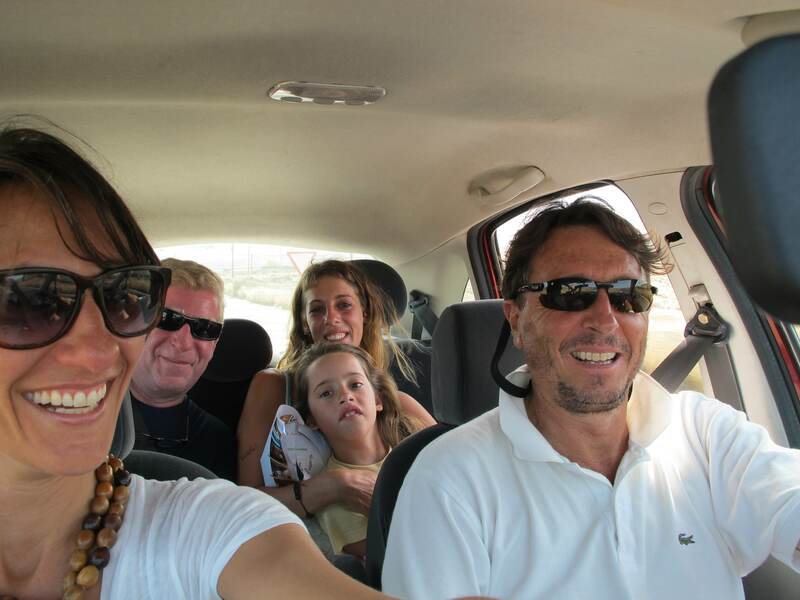 After a delicious lunch we decide to drive north towards the interior of the island. We were struck by the geography here. 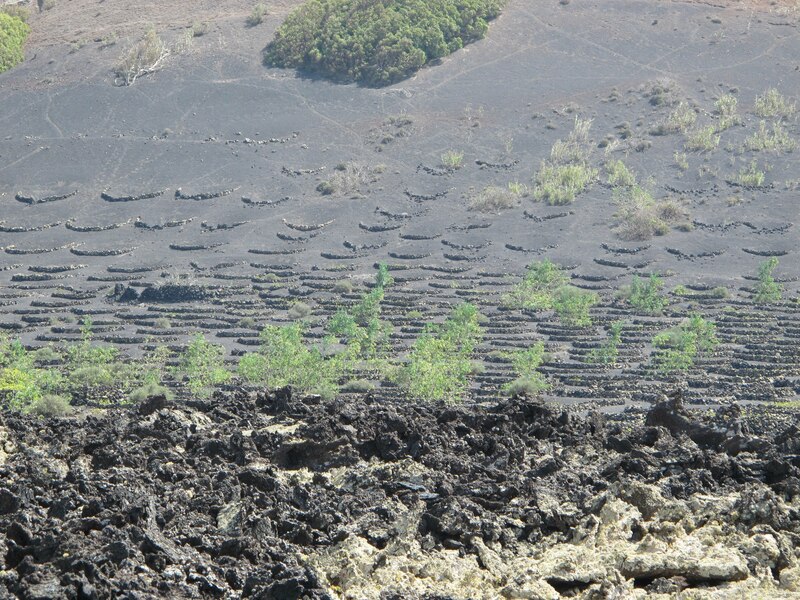 This treeless volcanic land is hot and arid. It is like being on another planet! We enter the state park and it is literally feeling like you are in the middle of nowhere. 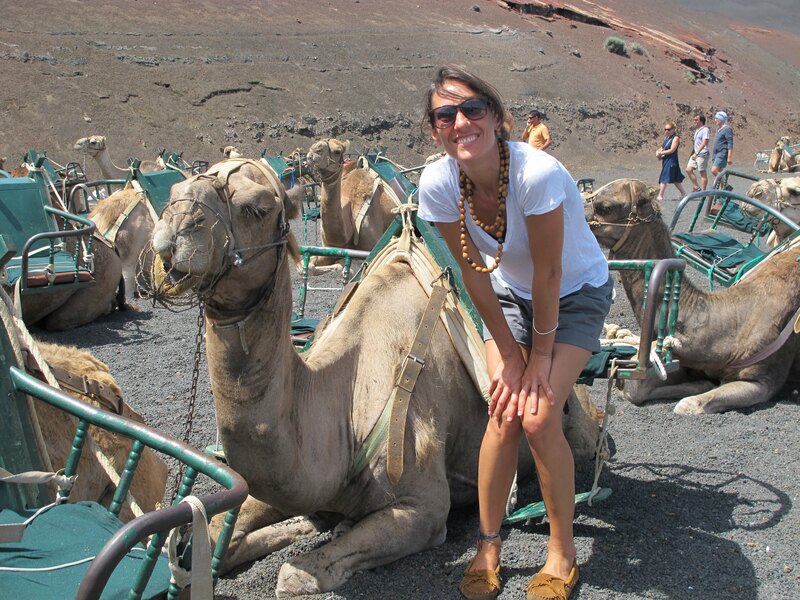 There are tours you can take on camels through the mountainside, but we chose the New York version – just to cruise right through… Meandering through the towns and countryside we also see vineyards and small farms… the dirt here is black and the vegetation is usually surrounded by volcanic rock walls to either protect the plants from wind or trap the dew and the water at night. We stopped to by some local wines and found gorgeous local crafts which included lava jewelry…. Of course I bought a ton of stuff! Parque Nacional de Timanfaya & Montañas de Fuego Camel Rides! Moving north on the island we come to a small town on siesta named Tequise. They take siesta seriously here! The entire town shut down for a nap! This village reminds me of the Cycladic Islands in Greece. As a matter of fact – the whole island does… much like Santorini if fact! Every single building is white stucco with blue, green or dark wooden trim. A woman sees us walking around and approaches us asking us for a ride to the northern most point of the island. We agree to take her and out pops her daughter too (she was at the bus stop sleeping) and in addition to the child, they haul out a bunch of bags – so we made room in our little rent a car and headed north! As we cruised the countryside towards the port town of Orzola, the beaches are on our right. The same beaches we saw on our arrival here 2 days ago. this was our LAND AHOY! After we dropped our new friends off at the port to catch the ferry to La Graciosa, a small island north of Lanzarote, we enjoy a delicious coffee. After that, we cruise back to towards to sunset to bring our first mate to the airport. This was his final destination. Manuel and I will continue on to the other islands on our own. 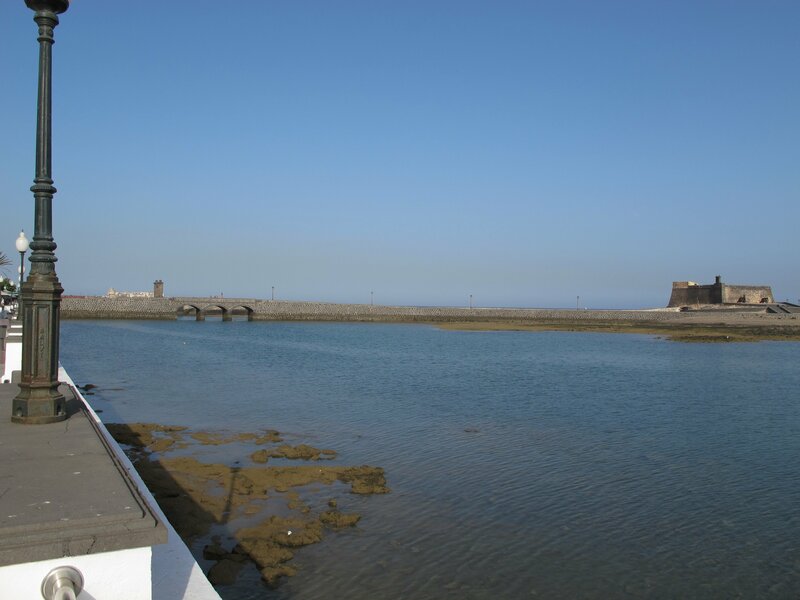 Port of Orzola in Lanzarote, C.I. Land Ahoy! 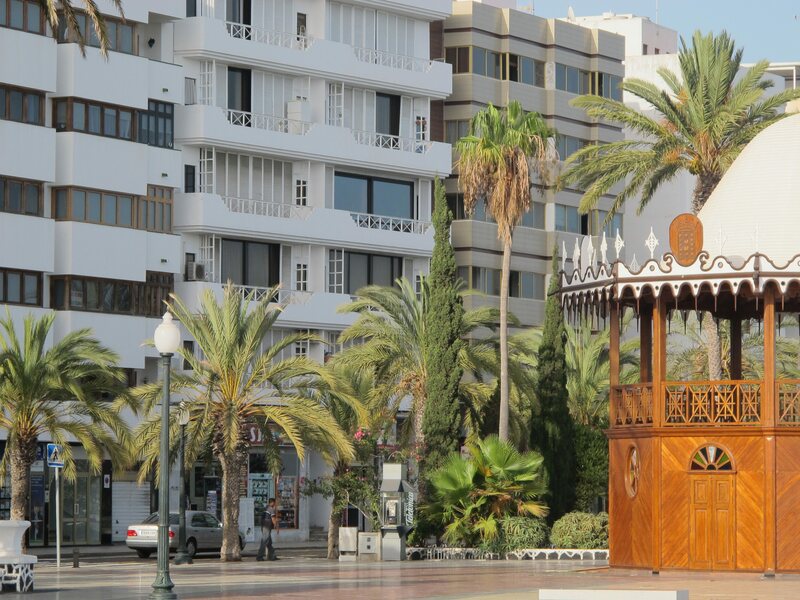 The city of Arrecife feels like a Latin American city not a European city. 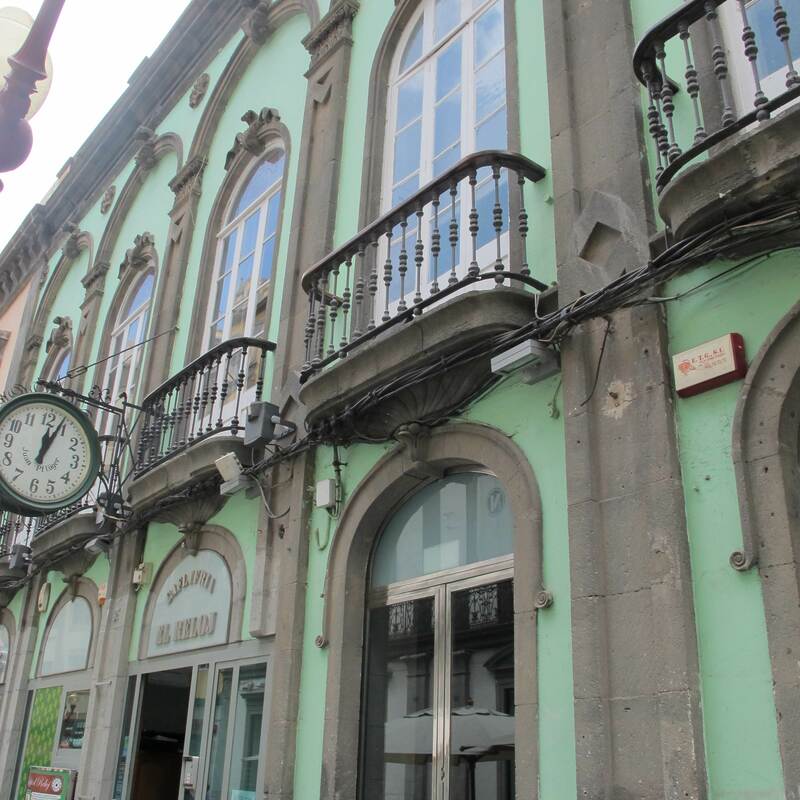 It is a port town with pedestrian streets and shops. The architecture is Spanish Colonial mixed with the 50’s and 60’s modern apartment buildings. After bumming around town and some shopping we return our little car, decide to have a Havana Club Rum at a local bar before we hitch a ride back to the Puerto Calero. The sun is almost set, the lavendar mountains are in front of us and the ocean sits ahead. We will be sailing in that direction to the next island tomorrow. After battening down the hatches and a little organizing, we go to sleep. 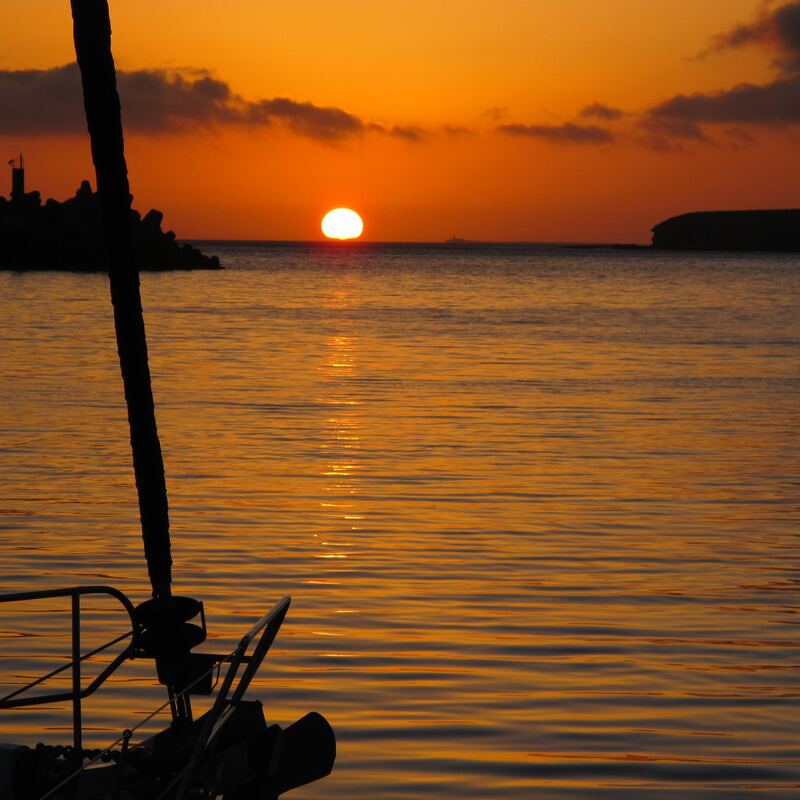 We have an early departure out of Puerto Calero tomorrow. Sunsets behind "Argo" our transportation to Fuerteventura tomorrow. The 13 hour sail started out smooth. 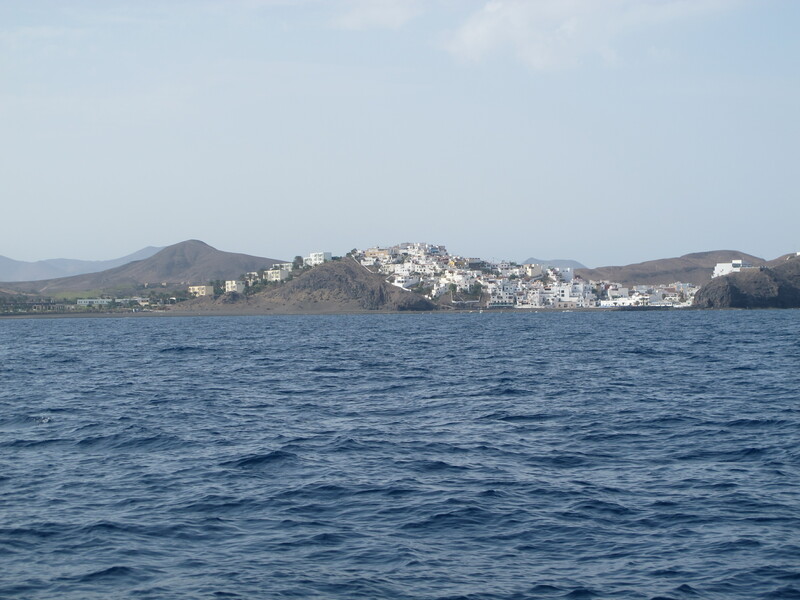 As we left the beautiful island of Lanzarote behind and had smooth seas ahead, it looked to be a promising sail. Even better? I would see land the whole time! In the distance we see the mountains of Fuerteventura, our next island destination. Small villages dot the treeless coastline that has dramatic black cliffs dropping into the ocean. Since the Canaries are the first pieces of land that the ocean meets after 1000’s of miles of momentum, on Fuerteventura, most of the people live on the south side of the island to protect them from wind. After about 8 hours of sailing we see some sport fishing boats headed toward what we think is the marina we see on our map. Gran Tarajal. The next stop is about 4 hours of sailing away along the coast – 4 hours closer to the next island as well – so we decide to press on. The sun still high in the sky we might make it before we lose sunlight. At around 6pm we hit are a beam a narrow part of the island that is known for its microclimate. The winds build up and over the mountainside and produce up to 40 mile and hour wind gusts, literally out of nowhere… as waves start to hit the boat and water splashes on board, we put on the rain gear and literally batten down the hatches! On our right there is a dip in the mountain range which funnels extremely strong winds onto the beach and water. The wind, so strong, chops up the water immediately on meeting it again. When the boat begins to rock back and forth and the wind begins to howell, even though we see land – it seems far away… A few rocky hours later it is dusk, we are close to our final destination as we search for the sea wall of the marina – the sea had calmed, it is dark and as we try to make out the port’s entrance! There it is! The green light we were looking for and then BOOM! The wind picks up again…. 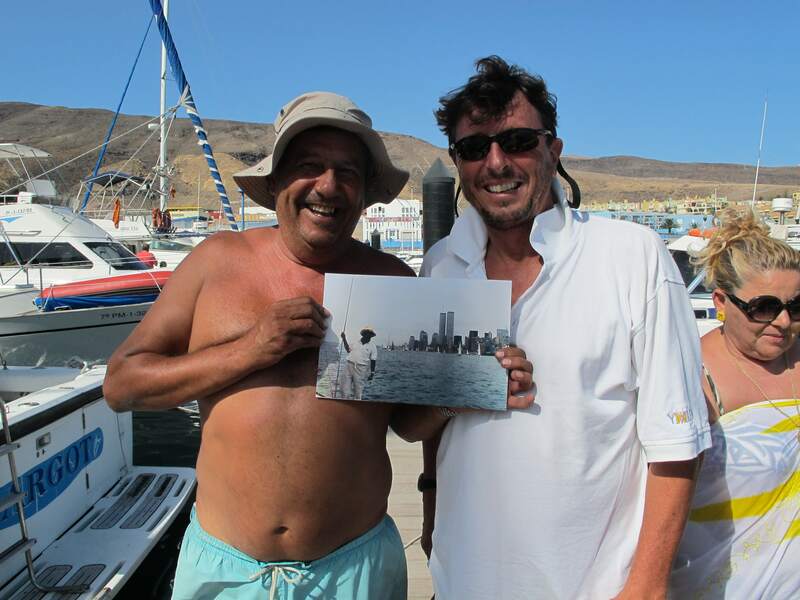 Manuel has read in the guide that this was a difficult marina to enter during the day and without wind! We had both working against us as we searched for the entrance – kranked the engines and avoided the breakers and sea walls on either side. Our arrival to the Marina at Punto Morro Jable might have been the talk to the town. We arrived during the night which always proves to be more difficult to dock and with the gusts of winds blowing us around we had a recipe for drama. We saw the marina slips but due to the night arrival thought it was closed so scratched off that option. Then we saw the platoons but did not think we could fit… so we thought to drop an anchor in between. A lovely French couple with their daughter (Laurent, Gwen and Lelo) pulled up to us in a dingy and in broken English to try to help us out and tell us where to go, then the Marina guard with her dog in tow was flashing us with her high beams and flashlight screaming “Cavalliero, Cavalliero” telling us we could not anchor. Then you had a group of 12 people on the docks placing bets on whether we were going to ground our boat as it was low tide. I put a flashlight to the water and land was just below. It was a total scene, the French family cruising back and forth relaying messages from the docks, the security guard yelling at us from the breakwater and the winds blowing our boat left and right. With that a message came in that there was a slip available! We were able to dock the boat in the marina – so we had to prepare the boat with bumpers and get ready to “pull in” – with the winds blowing us left and right and the group on the docks clicking their flashlights, we could not tell where the slip was… the radio is going off, the security guard is still yelling and then we see it! We decide to back in, and while docking we were greeted with too many people telling each other what to do! Due to the wind we come in pretty hot and Manuel starts throwing lines as a bunch of others on the dock out their hands out stop the boat from crashing into the dock, the dog is barking, people are yelling in Spanish – it was quite and entrance. The morning brought a nice surprise. The marina was beautiful there were plenty of boats and people around so the choice to dock was a good one. For about 11 euros we hook up to the water and the electricity and we decided to take a day off! Our American flag sits proudly on the back of our sailboat and one neighbor shows up with a picture of him in front of the world trade center! One of our neighbors showing off an old picture! Another neighbor befriends us immediately so we invite him for a rum and coke on Argo around noon. Jose Antonio is here with his beautiful family and enjoys speaking with Manuel about every nook and cranny of the Canary Islands and the surrounding seas. He is a good sailor and a Canarian. 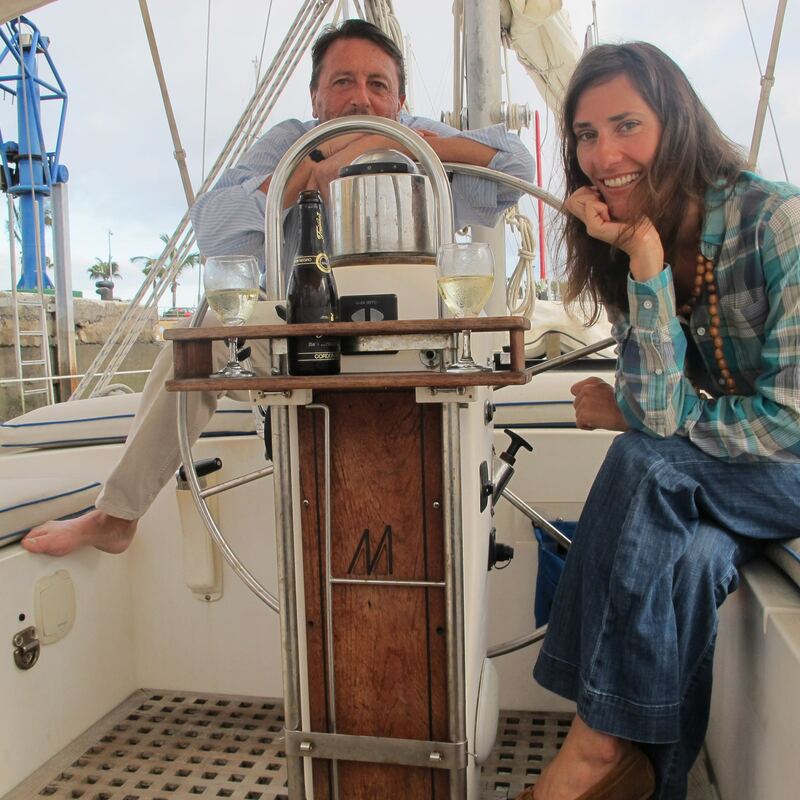 He has a 50 foot Beneteau that you could tell has seen a ton of ocean. Jose Antonio is a wealth of information on wind, climate, waves and routes between the islands and only speaks of sailing the entire time. He knows these waters so well that his family takes the high speed ferry home while he sails his boat alone! What you don’t know is that had fallen ill the night prior in that famous docking event. It must have been something I ate. I always get a stomach sickness when I am away, and with that always brings funny surprises, new doctors, new medicines and sometimes even new friends. I decide I need a clinic. Manuel asked around and by the time I got myself off the boat, the entire Marina knew I was not feeling well. Most of them just asked something with the word “mejore” which means “better” and I was not feeling better. In the true spirit of adventure we hitched a ride and combined the doctors visit with a quick 5 cent tour of the town. In retrospect, we might not have even stopped here and maybe even pressed on to Grand Canary with such an annoying approach to this funny little marina but my belly ache forced us to come in and stay 2 days while I got better. The moments made here were some of my favorite of the trip! We ride into town with a German named Mattias who has lived here for 3 years and is a tour guide. He loves it here. The town is a strip mall and everything is in German. If you are looking for a quaint village, don’t come here. We decide to head back to the marina where there is a local beach, a local restaurant and feels more quaint after I see a doctor and pick up some medicine which we found 10 minute away – the ony open pharmacy on a saturday – we head back to the marina… to get out of the hustle of the tourist trap. United Nations at the end of the dock! As the sun dips into the ocean we all stand on our boats, talking to each other sharing stories of where we have been and were we are going. We all soak in the most beautiful sunset, the marina is surprisingly calm. As the clouds continue to lay heavy on the mountain range in front of us, we check the weather and looks like condition will be great for sailing tomorrow. Best sunset of the trip! Jose Antonio who is discussing every nook and cranny of the current to the Manuel invites us on the boat with his family. We then leave for a dinner the marina restaurant and get some zzz’s we have a 7:30 am Departure tomorrow. Jose Antonio and his beautiful family! 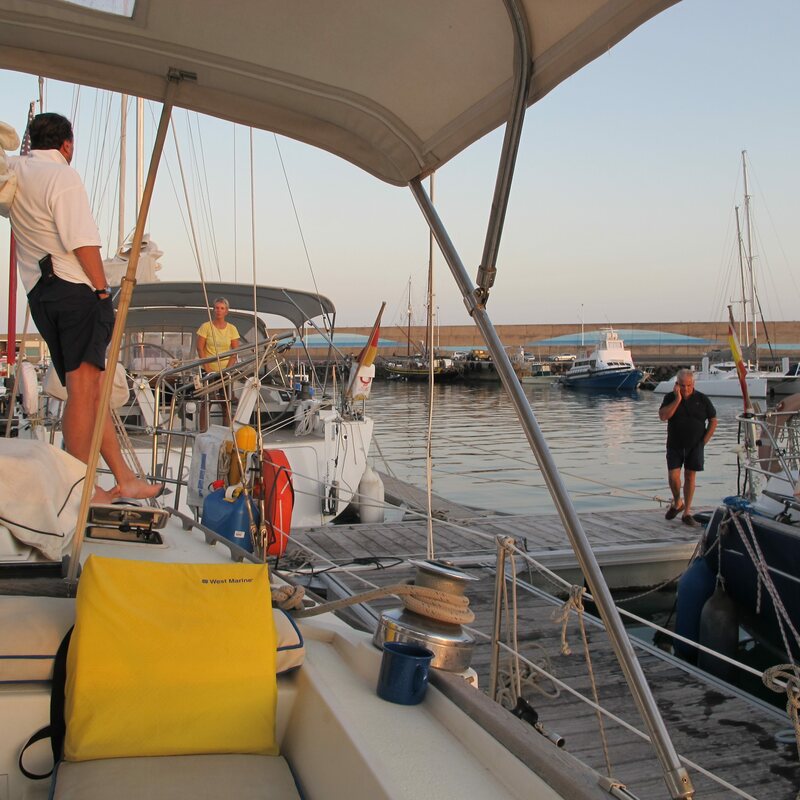 Sailing from Punta Morro Jable, Fuereventura to Las Palmas, Grand Canary. We were lucky: for some reason the wind wasn’t blowing this morning. We quietly loosened the lines while other boats slept and snuck out by 7:45am. The sun rises behind us to a golden sky and the sea calm ahead… The mountain clouds as they had been for the past 2 days and continue to do on a daily basis, quietly crawl over the mountains and disappear the moment they hit the water… the scene is beautiful. We put up the Genoa and the Bizzon and all is well, the marina shrinks behind us, the land stays on our left and somewhere straight ahead is Grand Canary Island, 8 hours away..
Cruising along for a while I see something behind us in the distance! It is another sail boat! And sure enough, here they come! The Germans on 12 moons! Slowly and surely catching up to us! 12 moons is a larger boat and probably doing a knot or 2 more than us… as they catch up to us we take pictures of each other get on the radio and give each other our email addresses! Waving along is was amazing to have a neighbor at sea! They are headed to Las Palmas as well and hopefully we will see them there! 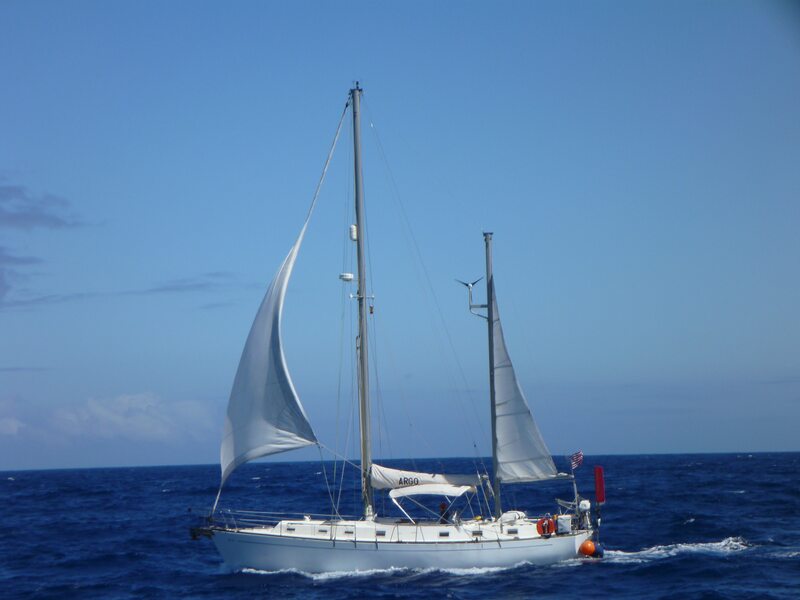 "Argo" rare to have a picture taken of your boat while sailing! The ocean seems small for a moment. As land begins to carve out a shape in on the horizon, we are a few hours away from the large port of Las Palmas. On arrival, I am shocked at the size of the city in front of us as Las Palmas has over a million people living here! I am also shocked at the size of the port and the many containers and ships that are here, finally I am shocked on how huge this marina is with about 1500 slips. When we arrive, the marina is closed, the Germans are tied to the entrance dock and we find a spot behind a family from Denmark. The captain on that boat kindly takes our lines and helps us in. 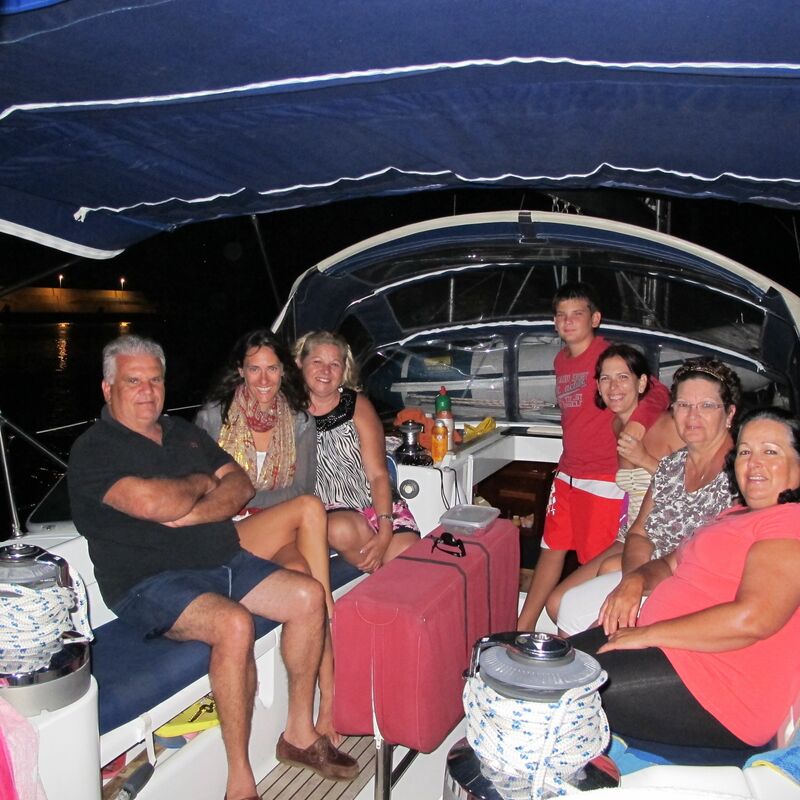 He is with his family and they just cruised in after 5 days of sailing from Portugal! We all have to wait till 8 am the next morning to see if there is room or space for us at the marina. Till then a Champagne toast and finding an internet connection. 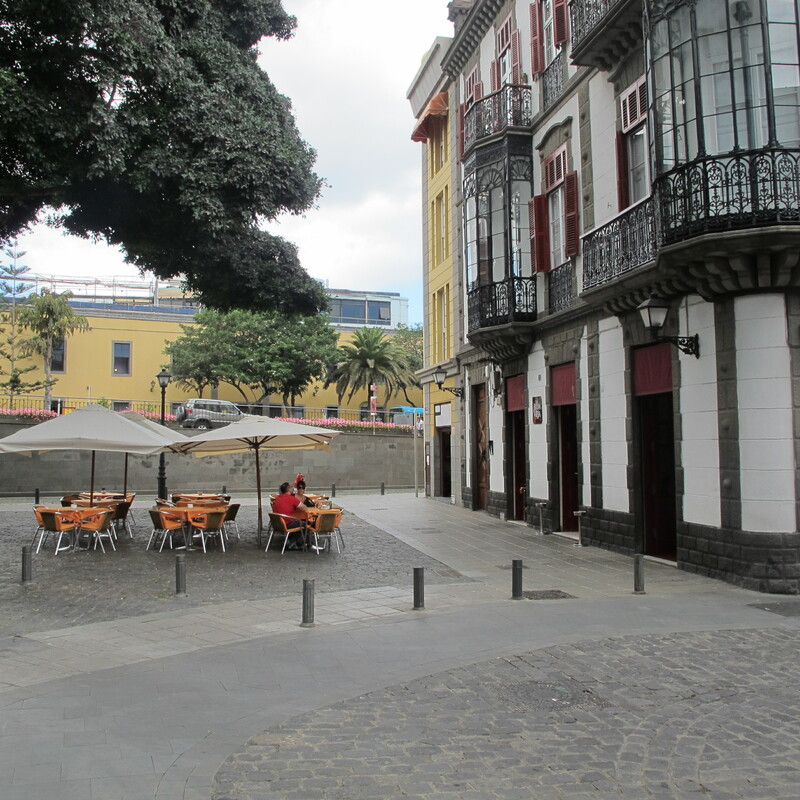 We only had a day in Las Palmas so we sent directly to the old city which was a 30 minute walk from the marina. Remember that Columbus came here before his sails and this is a huge port town – being part of Europe – this is a bustling European Port City. It is a bustling city with plenty of traffic… reminding me of a South American city. Colorful buildings surround us of old and new architecture. Our goal is to find the perfect lunch setting in the old city which we found. If you want to have a delicious lunch in a pretty setting go to Le Recova Vieja. It is also right next to the cathedral and sits as the entrance of the old city. Just beautiful. Our waiter is from Ecuador. His family is here too. There was an enormous migration of Latin Americans to Spain but since the economic recession and lack of work many of them are going back with the help of the Government. The government was actually paying people to leave…. really interesting. Anyway what’s better than local cheeses, fresh bread, salad and fish for lunch? We drank Tinto De Verano (sangria)… and it was perfect! 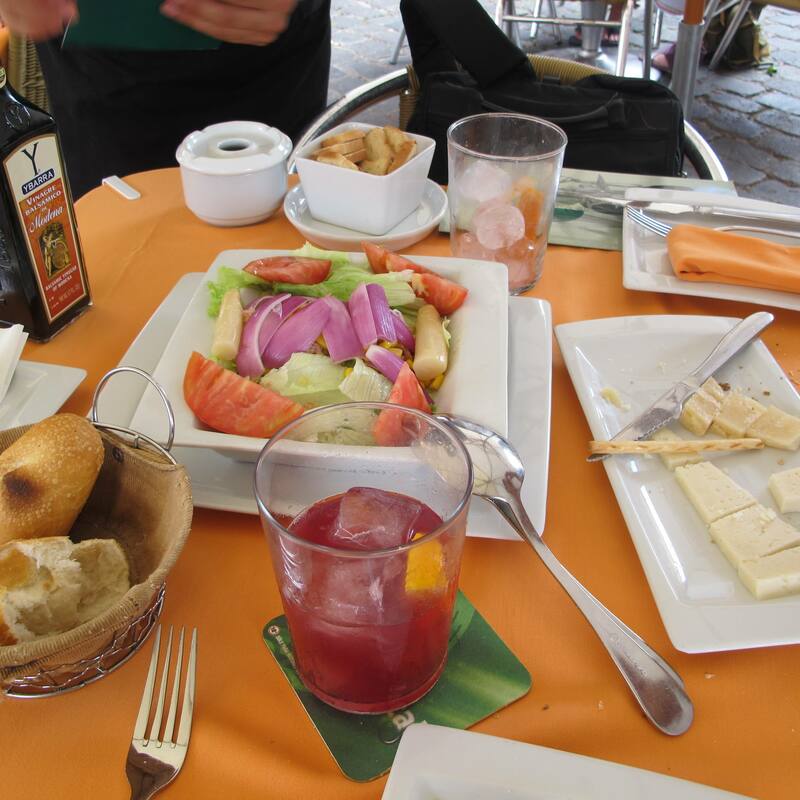 Local Cheeses, Tinto De Verano, Ensalata, Pain.. Perfecto! La Recova Vieja. Perfect Lunch Setting in the Pzta. F. Mesa de Leon Old City, Las Palmas. 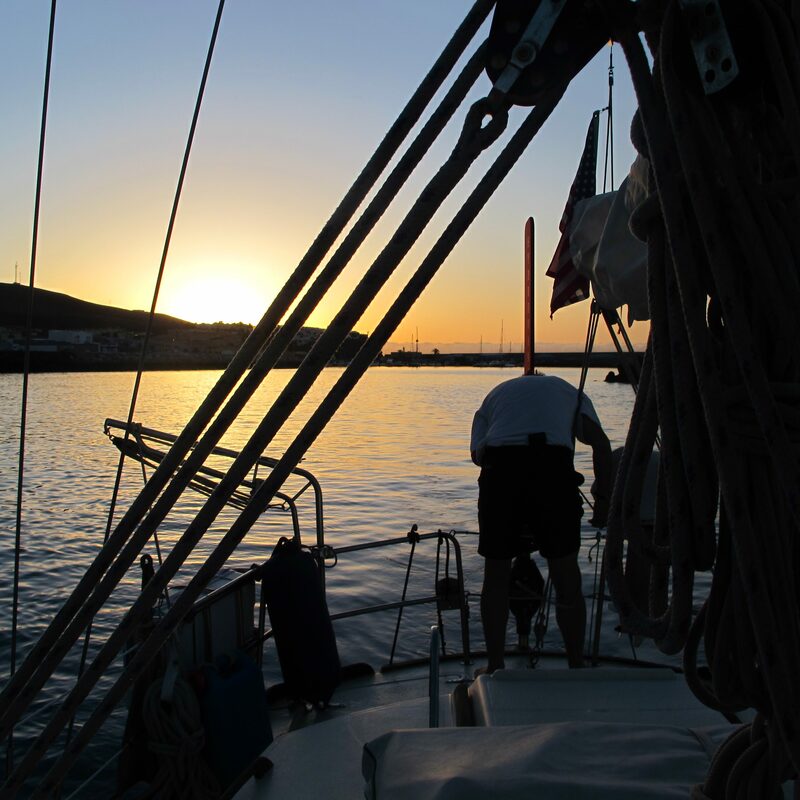 We rose with the sun and sailed through the enormous port of Las Palmas toward the South. With a 6 hour sail ahead of us this was peanuts compared to the last sails we have done. Oddly I calmed down. Manuel spotted a 7 foot shark in the water and it did not even bother me too much. As Grand Canary Island was in our sights we sailed quietly past the towns, the airport and even fish farms (which by the way are totally depressing. They are enormous cages in the sea… so the fish are trapped! I am now not going to eat farmed fish anymore either!) We pass resort towns and see sand dunes and beach umbrellas that most certainly Germans are sitting under and as we reach our final destination of Puerto Rico, I can’t believe it… I have sailed for about 150 hours – it is like skiing a double diamond before every skiing a green trail… I did it! We did it! Our voyage was over! At this point, I am throwing lines onto the docks, tying up bumpers and even steering the boat… could it be? Am I becoming a sailor? Boris and Marianne on "Chili"
The morning brings tons of duties while closing up the boat, we give Boris and Marianne our Perishable items, and before we knew we were racing to the airport to techno music in a taxi. I take Condor Airlines which is an amazing clean smooth flight and even serves dinner! Grand Canary Airport is awesome and their security lines are small as they have the best system. There is a section where people set up and get their trays and then walk to the detectors so there are NO LINES!!! Brilliant!! 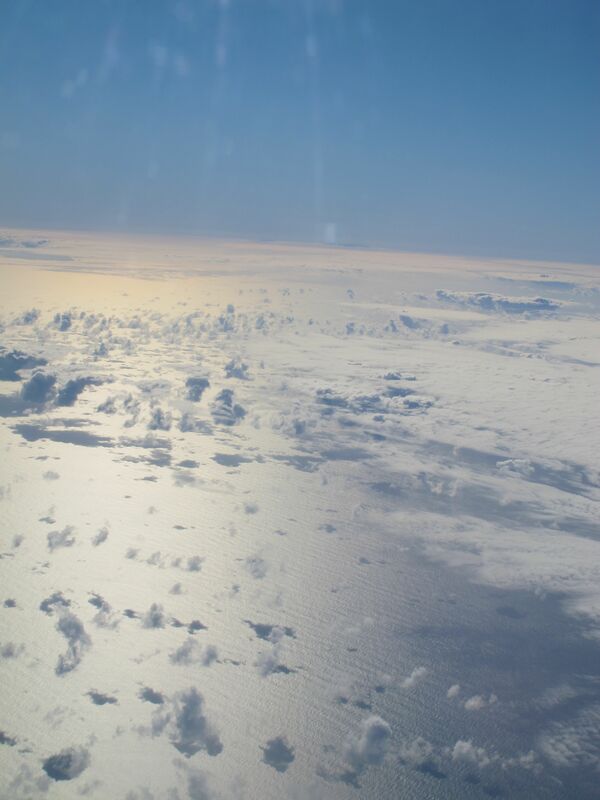 As Manuel and I part ways and I board my plane from the runway the old fashioned way – the plane take off towards the north… As I look out my window for the next 2 hours, I fly over the ocean that I sailed on. It looks so calm and serene, I spot a few cargo ships that look like peanuts in the ocean and think of our boat ARGO and what we might of looked like from an airplane flying above. The sunset is so magnificent and I realize that I will never look at the sunset or the sky or the stars or the moon the same again. These celestial beings were our sailing companions as I dream about getting on the ocean again soon to see it from that perspective. As the land of southern Spain appears beneath me… what took the plane just 2 hours to cross took our boat 108… simply amazing. The ocean we sailed beneath me... surreal. It has been quite an adventure! Thanks for reading!